George Wright (January 28, 1847 – August 21, 1937) was an American pioneer in the sport of baseball. He played shortstop for the original Cincinnati Red Stockings, the first fully professional team, when he was the game's best player. In 1868, Wright won the Clipper Medal for being the best shortstop in baseball. He was elected to the Baseball Hall of Fame in 1937. He was one of five men to play regularly for both the Cincinnati and the Boston Red Stockings, the latter winning six championships during his eight seasons to 1878. On April 22, 1876, he became the first batter in National League history, and grounded out to the shortstop. Elder brother Harry Wright managed both Red Stockings teams and made George his cornerstone; the brothers are now both in the Hall of Fame. George helped define the shortstop position and on-field teamwork, but his main work as a sporting developer came after retiring from baseball. After arriving in Boston he entered the sporting goods business, soon under the name Wright & Ditson's. There he continued in the industry, assisting in the development of golf, tennis, and hockey. Born in Yonkers, New York, twelve years younger than Harry, George Wright was raised as a cricket "club pro", assisting their father (Samuel Wright) as Harry had done. Before George's birth, Samuel Wright's St George's Cricket Club moved from Manhattan across the Hudson River to Elysian Fields, Hoboken, New Jersey, where many New York and New Jersey base ball clubs played in the 1850s. Both boys learned base ball, too, but George grew up with the "national game" and was barely in his teens when the American Civil War curtailed its boom; Harry was already twenty-two when the baseball fraternity convened for the first time, and thirty when the war ended. Wright was the father of tennis great Beals Wright, a U.S. Championship winner and Olympic gold medalist, and Irving Wright, U.S. Championship men's doubles champion. At some times during the war, both Wright brothers played for the venerable Gothams, the second eldest baseball team after the Knickerbockers. According to Ivor-Campbell (1996), George moved from the Gotham juniors to the senior team when he was fifteen. At seventeen in 1864 he was the regular catcher. Baseball's recovery from the American Civil War was far advanced in greater New York City (always untouched by the military conflict), as the leading clubs played more than twenty NABBP matches, the Gothams eleven. George played eight and led the team both in runs, scoring 2.4 times per game, and "hands lost", put out only 2.4 times per game, average being three per player in a 9-inning game. In seven matches infielder Harry was fourth in scoring at 2.0 and second behind George in hands lost at 2.6 (Wright 2000: 91). For the 1865 season George was hired by the Philadelphia Cricket Club; that summer he played in five matches for the Olympic Ball Club of that city. The Olympic club was the devoted to games in the base ball genus, established in 1833. At the December annual meeting, the first in peacetime, National Association of Base Ball Players membership tripled, including isolated clubs from as far as Fort Leavenworth, Kansas and Chattanooga, Tennessee. Wright returned to the Gothams for base ball; he was nineteen and nearing his athletic peak. At the same time, Harry Wright moved to Cincinnati for a job at the Union Cricket Club. Early in the summer of 1866, Wright moved from catcher for Gotham, which played eight NABBP matches that year, to shortstop for Union, which played 28, the leading number. The Union of Morrisania, now in the New York borough of the Bronx, were another charter member of the first Association, but one that moved toward professionalism in the postwar years, as the Gothams did not. In 1867, he joined the Nationals of Washington, D.C., eldest club in that city, whose approach to professionalism was arranging government jobs, mainly with the Treasury. He played second base, shortstop, and pitcher in 29 of the 30 matches fully on record and in those matches led the team both in scoring and hands lost. Next year he returned to the Unions for the association's last officially all-amateur season and moved permanently to the shortstop position. The Cincinnati Red Stockings in 1869. Wright is second from left in the back row. Meanwhile, brother Harry had acquired baseball duties and had organized for Cincinnati the strongest team in the West, led in 1868 by a handful of players from the East—presumably compensated somehow by club members if not by the club. When the NABBP permitted professionalism for 1869, Harry augmented himself and four incumbents with five new men including brother George, who was highest paid at $1400 for nine months. George remained a cornerstone of Harry's teams for ten seasons. Cincinnati toured the continent undefeated in 1869, as George batted .633 with 49 home runs in 57 games. 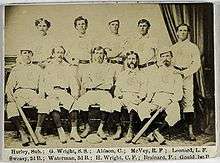 It may have been the strongest team in 1870, but the club dropped professional base ball after the second season. Harry Wright was hired to organize a new team in Boston, where he signed three teammates including George for 1871. He brought along the nickname, too; if the nickname is the tenth man or the player-manager counts double, Harry thereby composed half the team that just missed winning the first National Association pennant. George suffered a broken leg and missed half the season; one more win at the right time would have been decisive in Boston's favor. The Providence Grays, new in the NL for 1878, hired George to lead the team in 1879. He did as well as possible, wresting the championship for himself from older brother Harry; for Providence and Rhode Island from older and regionally dominant Boston and Massachusetts. But Wright & Ditson Sporting Goods was growing, so George returned to Boston for business reasons. He remains the only man to win the pennant in his lone season as manager. Meanwhile, the National League introduced the reserve list system, and Providence listed George, so he was not free to sign with Boston. (Until the 1879–80 off-season, every professional baseball player was a "free agent" for every season.) During the next two seasons he played only a few games.. When Boston changed managers for 1882, Harry signed to lead Providence and inherited the right to sign his brother. George agreed to play another season full-time, retiring after the 1882 season with a .302 batting average in the major leagues from 1871. In 1882 George Wright took up cricket seriously again with the Longwood Cricket Club of Boston where he dominated local cricket sides with Isaac Chambers, the Longwood cricket pro and greenskeeper, holding up the other bowling end. In 1891 George Wright captained the Longwood Cricket Club against Lord Hawke's visiting English side. Wright's side surprised the visiting English first-class players with accurate bowling which kept the tourist in check. In 1892 George Wright donated cricket gear to British Guianese (Guyana) cricket players thereby starting a century old tradition of West Indian cricket in New England. 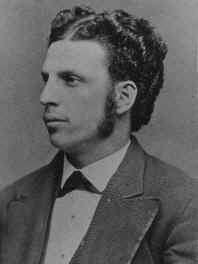 Wright holds the NA career record for the most triples (41), and he led the NA in triples with 15 in 1874. George was elected to the Baseball Hall of Fame in 1937 and inducted by the Cincinnati Reds Hall of Fame in 2005. Elder brother Harry is another member of both Halls. Unfortunately, the official National "Hall of Fame Biography" of George credits him with "piloting" six championship teams in Boston, which was Harry's achievement, beside managing his one Providence champion (NBHOFM a). Younger brother Sam Wright also played baseball professionally, with brief appearances in the major leagues. Wright lived long enough to be consulted regarding the baseball centennial celebrations of 1939, including the establishment of the National Baseball Hall of Fame and Museum in Cooperstown. Soon after his own election, he died in Boston of a stroke, aged 90. He is buried in Holyhood Cemetery, in Brookline, Massachusetts. Wright also laid out New England's – and America's – first public golf course, Boston's Franklin Park in 1890. Wright and Ditson Sporting Goods imported and sold golf clubs; early U.S. Open champion Francis Ouimet worked at the store while pursuing his amateur career. Wright later donated the 156 acres (0.63 km2), the former Grew estate, for Boston's second municipal course which became the Donald Ross-designed George Wright Golf Course located in the Hyde Park section of Boston. ↑ Find a Grave lists simply him as "Baseball player, Hall of Famer. Golf course builder." The construction of George Wright Municipal Golf Course was a minor event in the history of public space, a conversion of part of Frederick Law Olmsted-designed park. ↑ Shelley, Jeff. "George Wright Golf Course: A Boston Gem". Cybergolf. Retrieved December 21, 2012. ↑ David Sentance, Cricket in America. ↑ George Wright's official plaque (NBHOFM b) navigates the need for extreme brevity without making the same blunder but it may have confused the recent author of the Biography. [NBHOFMa] "George Wright". Retrieved 2006-08-30. "Wright & Ditson: About Us: George Wright", Wright & Ditson website.